Our Mexico-based partners for the American Association of Museum’s Museums and Communities without Borders grant pulled out at the last minute citing a conflict with their mission. I put a considerable amount of time into building this program at the request of the Community and I really took the project and its goals to heart. It is very difficult to accept that our brilliant $105,000 project, which was accepted into the second round and had a really good shot at winning, was crushed at the last minute by environmental politics. I understand the other institution’s position in theory, but this project is about living people. I’ve never encountered someone willing to trade plants for people. In fact, I don’t believe the board member who lead the opposition knew what the project was about. I believe they objected on principle. I don’t mind the objection, but I wish they would have let us submit the project so we would have had the opportunity to find a new partner. In fact, this weekend at the Anza-Borrego Archeology Weekend we connected with a great contact from the El Museo Comunitario de Tecate who would have been a much better match for this grant. I wrote a letter, a long email, to Radio Lab, hoping to at least accomplish one goal of the project, even if it can’t be funded this year. The point of Yumans Without Borders was to engage communities in meaningful dialogue of border issues beyond the well-recognized issues of drug trafficking and immigration. Even if nothing comes of the email, I feel like I’ve made an effort to accomplish that goal. At the very least (though it is little consolation) we can honestly say we did our best to fulfill the Community’s request and it didn’t fail on our end. The project Yumans Without Borders: Stabilizing indigenous culture along a de-stable US-Mexico border stimulates dialogue between border communities besieged by escalating violence and depreciating cultural identity. Indigenous youth, aged 14-18, will spend an intensive six-month period studying Yuman culture and language with the intention they will pass on that information and eventually become tribal leaders with a deep understanding of tribal culture. The Yuman people of the southwest US and Baja California, Mexico, are a single Native American community divided by an artificial border. The traditional Yuman cultures that stride the border between California and Mexico are deteriorating under the violence associated with the drug trade, issues associated with illegal immigration, destruction of cultural lands for renewable energy, and the strengthening of border enforcement. Connections across the US-Mexican border were fluid until the last generation when the living situation for Mexican Yumans became dangerously caught up in local drug politics. The US State Department issued a travel warning on April 22, 2011 that included the text, “Much of the country’s narcotics-related violence has occurred in the border region.” Under these circumstances, developing a strong cultural identity with Yumans across the border provides a source of strength; a reminder that they are part of a larger community with shared similarities. This project centers upon two cultural exchange points: the physical exchange of living traditions across the US-Mexican border and the long-distance cultural exchange of youth interacting over digital media and social networks. Youth on both sides of the border will receive iPads to interact in a cultural exchange surrounding the theme Living Kumeyaay. There is a perception that Native American culture only exists in the past. Youth will address this perception by discussing their views and experiences. Do they partake in cultural traditions? Are they proud of their heritage? Do they promote it to others? Over weekly Skype conferences and shared videos, pictures, stories, and artwork, the youth will comment on each other’s posts. Developing lifelong relationships with their counterparts across the border will build common ground and stimulate their interest in a shared language. Meanwhile, project instructors will alternate travel to the youths’ locations. Instructors may include elders, artisans, or one of the 36 remaining native speakers of Kumeyaay, the Yuman language. Youth will beinstructed in traditional craft production and taught the language associated with the processes. Through this situational fluency method, the youths’ oral language skills will develop as they physically interact with the Yuman vocabulary. The public will be invited to share in this exchange through social media, public receptions, and public hands-on craft sessions. The escalation of tension along the US-Mexican border has restricted cultural diffusion. Yumans Without Borders will engage indigenous border communities in meaningful dialogue through youth-based cultural exchanges aimed at creating cultural fluency. The project will bring celebration, stabilization, and preservation to local communities besieged by complex border issues, strengthening the understanding and appreciation of traditional cultural crafts and language, and will result in the strengthening of shared cultural values and shared identity. The County Library has been hosting it’s Access Program in the Museum. Once an month books and internet are publicly available for a town that has no library. We continue a public exchange library the rest of the time. Though without a copy of the Hunger Games, how can we call ourselves a proper library? I think the most recent title is from Thomas Thompson (who past away in 1982). I donated some Margret Atwood and a new copy of Jobs Interview Skills 101. I encourage everyone that I meet to donate whatever current titles they can bear to part with. We can do better for the residence of Ocotillo. 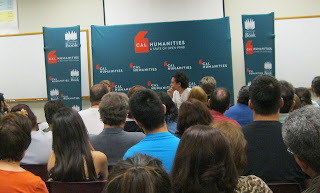 As a new unofficial branch of the library, we are encouraged to take part in Cal Hum’s California Reads! It’s a state wide reading program that includes public interviews with the authors. Last month we read Lost City Radio by 35 year old Peruvian-American Daniel Alarcon. He was on the New Yorker’s 20 Promising Writers Under 40 list in 2010. This week he was in El Centro (just down the road, 26 miles). Daniel was articulate, intelligent, and interesting – all at once! Lost City Radio was more an intellectual exercise on developing humanistic themes and experimenting with time in written literature rather than a romping good read. I confess I thought the interview would be dry and serious, but this is a young man just developing his voice. He thinks very seriously about his work, but is still a young kid at heart. I look forward to seeing more from this author, and for the next book in the Reads! program. If there is more of this ahead then I’m happy to participate. I should have trusted the system and stifled my skepticism. The County Librarian here is phenomenal. While the CalHum team was in town, they hosted a meeting for their California Story Fund. They haven’t had applications from Imperial County for a several years. I’d just explained that I’m a curator at the museum and am supposed to focus on that task – I’m not supposed to be committing to write another grant – but the museum is happy to be a partner on any projects. How can we be sitting at the table with people saying “please please apply” and not respond? I looked at the other 3 people in the meeting and challenged them to commit to applying next year. The County Librarian looked back at me and said “I’m swamped, but I have a couple of ideas for you”. The next day the President & CEO of Cal Humanities, who had introduced the interview, wandered into the museum on his way back to San Diego. I told him he’d be hearing from us soon. Looks like it’s going to be us applying next year. I’ve been back in Ocotillo for 4 days. Day 2: IMLS funded California Connecting to Collections (C3) preservation grant funding workshop. Consensus view: our 6 week workshop holds it’s own against C3’s nationally funded state program. Day 3: Surveyed and processed the Museum Society’s records. Discovered that updated copy of the By Laws. And a mouse skeleton. You don’t need to see that picture. Today, Saturday, I went shooting for the first time, even though it was high winds. I was nervous about this, but told that we wouldn’t be shooting at any distance where bullets could stray, it would just be a challenge aiming at the target. I was fine holding the empty gun, but once that baby had bullets in it I treated it with kid gloves. Loaded guns are scary. We shot a .22 and a .537. I liked the .537. It kicked. We did target practice with the .22 and I managed to hit where I aimed a few times… at 10 feet. I backed up to give myself more of a challenge (15ft) and shot a bit wide, but come on… 25-35mph winds. I was getting blown around like a tumble weed. Two perfect bulls-eyes, three slightly less so. As Day 5 approaches you can’t help but wonder what’s next. Actually, I know what’s next because we’ve reviewed the priorities, it’s just a matter of getting it done. Had a productive meeting with several community members regarding the AAM’s Museums and Community Collaborations Abroad grant. Once again this museum community has a brilliant idea for a project. We are working to developing partnerships and programs that will strengthen the relationships between a community divided by an artificial border: the Yuman people of the southwest USA and Baja California, Mexico. I’m ridiculously excited about this project. Though the deadline is fast approaching, with a little hard work we can get the information together… and what do we do around here except work hard, I ask you? The grant seminar is in it’s last days and I can now report that we achieved and exceeded our goal of preparing 9 grants. We prepared 11 grants in total and so far submitted 6. The remainder are waiting for just a few more materials to be collected, or can’t be officially submitted until the new year. We had 30 participants in the seminar, several of who assisted with preparing the grant text. These folks compled approximately 25 hours of work outside the seminar. Staff spent 178 hours outside the seminar contacting prospective project partners, arranging letters of commitment and support, editing and writing grant text and preparing the budgets and work plans. These grants lay out our plans for the museum facility and programming, and they are REALLY GOOD ideas. We are using my last few days to solidify plans for the conservation assessment that I’ll return to complete in January. The first installment of the new lab equipment begins on Monday. The grant workshop is going great. We have had 22 participants over the last 3 weeks working on various funding projects. At the half way mark, we are more than half way to our goal of preparing 9 grants by the end of the program. Preparing so many projects in such a short time is a real challenge. The museum has a number of good ideas that just need funding, but we keep coming up with more. We just completed an NEH planning grant that will pave the way to develop a sustainable standard for museum storage climate parameters. It just needs to get funded. Even if it doesn’t the work plan revealed some important priorities that need to be addressed, so very worth the time we invested in it. At today’s session, the second to last, we finished up another grant and started working on the 6th. Whew! Going to be a busy weekend. One of the big projects I worked on all those months ago has born fruit: the Museum was awarded the grant from the British Library’s Endangered Archives Project. They have accepted our detailed proposal and the next archivist on board will be adding to our collections by collecting pre-1900 governmental and family records. The rest of my job on Grand Turk entails making sure that the records that do exist, and the systems I’ve put in place, are clear and easy to replicate. Nothing more insidious in an archive than re-inventing the wheel. The next week will be spent making sure that everything will run smoothly for the next in command (with some swimming squeezed in).